FAST-ACT is offered in pressurized cylinders capable of addressing both liquid and vapor hazards, manually dispersed containers, kits for liquid hazard treatment, and mitts for equipment and small scale decontamination. FAST-ACT can be safely applied to any liquid spill or vapor release enabling Emergency Responders to utilize one technology when faced with a wide variety of known or unknown chemical hazards. 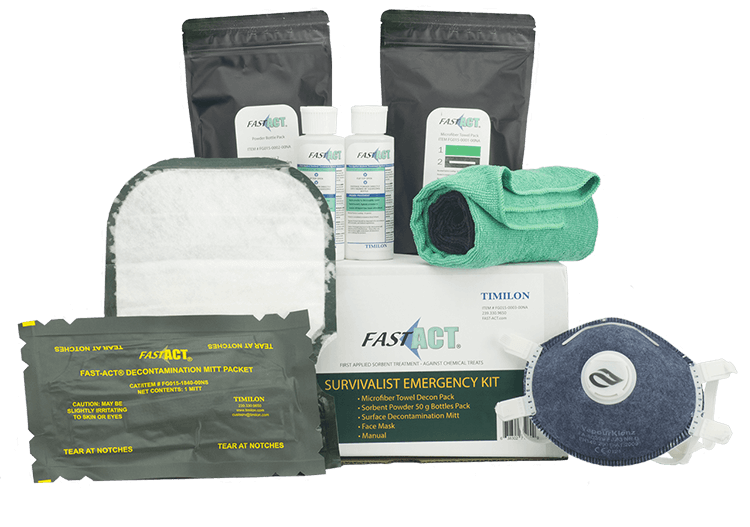 FAST-ACT immediately contains or neutralizes acids, bases, and other chemical hazards (including CWAs) – safely and in a single response tool.FAST-ACT provides safety benefits beyond traditional measures. The broad range of utility makes FAST-ACT a valuable tool for a variety of environments including: public and commercial transportation, government facilities, laboratories, production facilities, shopping and entertainment venues, police, fire, and other emergency response, healthcare facilities, any place where hazardous chemicals are a potential threat. The broad spectrum capabilities of FAST-ACT make it an ideal solution for surface decontamination regardless of agent composition. The neutralization ability of FAST-ACT breaks down many compounds to safer byproducts while reducing the threat from harmful vapors.